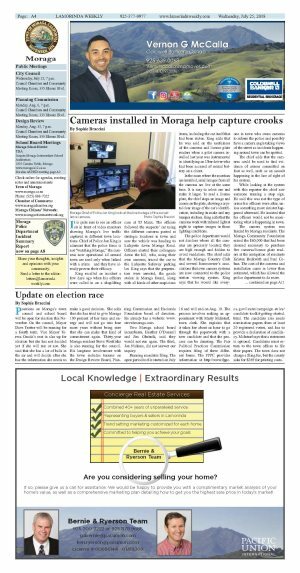 It is quite rare to see an officer sit in front of video monitors showing Moraga's live traffic captured in different town locations. 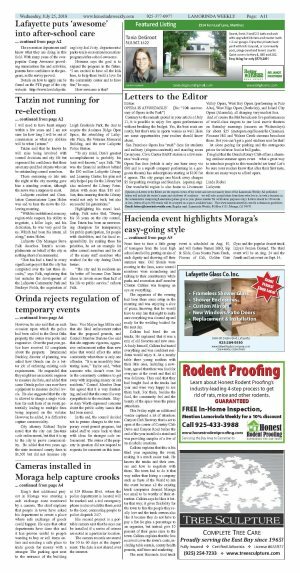 Chief of Police Jon King is adamant that the police force is not "watching Moraga;" the cameras now operational all around town are used only when linked with a crime - and they have already proven their efficacy. King recalled an incident a few days ago when his officers were called in on a shoplifting case at TJ Maxx. The officers followed the suspects' car using the different cameras posted at strategic locations in town and saw the vehicle was heading to Lafayette down Moraga Road. Officers alerted their colleagues down the hill, who, using their own cameras, traced the car to the Lafayette Safeway parking lot. King says that the perpetrators were arrested, the goods stolen in Moraga found, along with all kinds of other suspicious items, including the car itself that had been stolen. King adds that he was sold on the usefulness of the cameras and license plate readers when a pilot camera installed last year was instrumental in identifying an Uber driver who had been accused of sexual battery on a client. In the room where the monitors are installed, small images from all the cameras are live at the same time. It is easy to select one and make it larger. To read a license plate, the chief stops an image and zooms on the plate, showing a crystal clear image of the car's identification, including its make and any bumper stickers. King adds that the cameras work with infrared light at night to capture images in those lighting conditions. The police department would not disclose where all the cameras are precisely located; they are high enough and hidden to avoid vandalism. 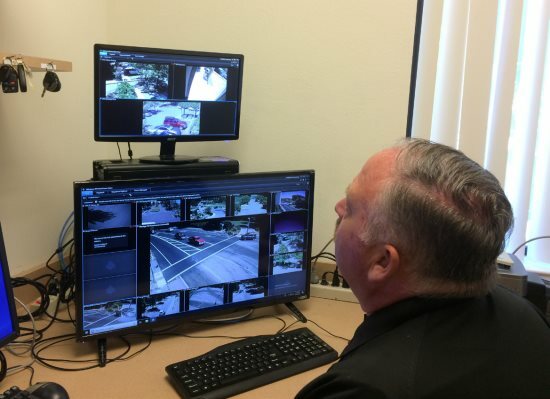 The chief adds that the Moraga Country Club and several homeowner's associations that own camera systems are now connected to the police station viewing system. King says that he would like everyone in town who owns cameras to inform the police and possibly have a camera angle taking views of the street so incidents happening around town can be spotted. The chief adds that the cameras could be used to find evidence of crimes committed on foot as well, such as an assault happening in the line of sight of his system. While looking at the system with this reporter the chief saw someone running a stop sign. He said this was not the type of crime his officers were after, unless something more sinister happened afterward. He insisted that his officers would not be monitoring what is happening in town. The camera system was funded by Moraga residents. The Moraga Community Foundation raised the $60,000 that had been deemed necessary to purchase five cameras/license plate readers at the instigation of residents Kristen Beckwith and Paul Cohun. The cost of the cameras and installation came in lower than estimated, which has allowed the police department to do more. King's first additional project in Moraga was creating a safe exchange zone monitored by a camera. The chief explains that people in town have asked his department to create a place where safe exchange of goods could happen. He says that other departments have done this and it has proven useful to people wanting to buy or sell items online and needing a safe place to trade goods for money with a stranger. The parking spot next to the entrance of the building at 329 Rheem Blvd. where the police department is located will be marked and a red emergency phone is also available there, next to the door, connecting people to police dispatch 24/7. His second project is a portable camera unit that he says can be installed if a series of crimes are noted in a particular location. The camera records are stored for 30 to 60 days at the department. The data is not shared over the internet.